The Constituency for Africa (CFA) announces its collaboration with the African Union (AU) and the Elliott School of International Affairs at the George Washington University for the 2017 Ronald H. Brown African Affairs Series. This year's Series will be held from September 18th through September 23rd in Washington, DC. "I am excited about CFA's partnership with the African Union and George Washington University," stated Mr. Melvin P. Foote, CFA's Founder, President & Chief Executive Officer. "We have worked closely with both institutions in previous years, and our collaboration this year affords CFA the opportunity to more closely align our efforts with the AU and George Washington University to engage the Diaspora on meaningful policy issues that affect the lives of hundreds of millions of Africans and Africans in the Diaspora." The theme of the 2017 Ronald H. Brown Series is "Mobilizing the Diaspora in Support of the U.S.-Africa Agenda." The purpose of the Series will be to bring together stakeholders from the U.S., Africa, and throughout the Diaspora to assess the U.S. Administration's Africa policy, and to identify challenges and opportunities. Participants in the Ronald H. Brown Series will discuss critical issues in a number of key areas, including Healthcare Infrastructure, Democracy & Governance, Trade & Investment, Next Generation Leadership, Agriculture, and Diaspora Engagement. Based on these discussions, CFA and its partners will produce a Diaspora strategy to include policy recommendations for the U.S. Administration and the AU. Over the first three days of the Ronald H. Brown Series, CFA will convene several policy roundtables at the AU Mission in Washington, DC. "The AU looks forward to hosting CFA and its participants. Over the years, we have followed CFA's work closely, and believe that CFA is having tremendous impact on U.S.-Africa policy. Additionally – and just as important – CFA's work to educate and mobilize the African Diaspora is consistent with one of our key activities at the AU Mission. The AU is fully aware that sustainable development in Africa must involve the African Diaspora," said H.E. Arikana Chihombori, the AU's Permanent Representative to the U.S.
After the conclusion of the policy roundtables, CFA will convene a U.S.-Africa Policy Forum hosted by the Elliott School of International Affairs at the George Washington University in Washington, DC. In 2016, this Policy Forum was Co-Chaired by the Honorable Andrew Young, former U.S. Ambassador to the United Nations and Mayor of Atlanta, Georgia; and His Excellency Hage Geingob, President of the Republic of Namibia. "Last year's U.S.-Africa Policy Forum was a tremendous success," said Ambassador Reuben E. Brigety, Dean of the Elliott School of International Affairs (ESIA), who hosted and moderated the Forum. "Based on our experience last year, ESIA expects the upcoming U.S.-Africa Policy Forum to provide a platform for a robust and productive policy discussion. I look forward to an exchange of ideas, and the development of substantive policy recommendations for the U.S. Government and the African Union." ESIA will also host the CFA Chairman's Reception on the evening of Wednesday, September 20th. For more information on this year's Ronald H. Brown African Affairs Series and to register for events, please visit www.ronaldbrownseries.org. 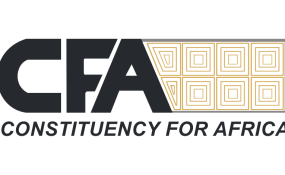 For over 26 years, CFA has established itself as one of the leading, non-partisan organizations focused on educating and mobilizing the American public and the African Diaspora in the U.S. on U.S.-Africa policy. As a result, CFA has helped to increase the level of cooperation and coordination among a broad-based coalition of individuals and organizations committed to the progress, development, and empowerment of Africa and African people worldwide. The African Union Representational Mission to the U.S. is the first bilateral diplomatic mission of the African Union. Officially launched on July 11, 2007 in Washington, DC, its mandate is to undertake, develop, and maintain constructive and productive institutional relationships between the African Union and the executive and legislative branches of the U.S. Government, the African Diplomatic Corps, the Africans in the Diaspora, and the Bretton Woods Institutions. The George Washington University has educated generations of international leaders and advanced the understanding of important global issues since 1821. The Elliott School of International Affairs, named in honor of former GW President Lloyd H. Elliott and his wife Evelyn, is dedicated to this mission. ESIA trains its students in the theory and practice of international affairs, offering them in-depth analysis of international economic, political, scientific and cultural issues. The School's widely respected faculty prepares Elliott School students for global careers in the public, private and non-profit sectors. Copyright © 2017 Constituency for Africa. All rights reserved. Distributed by AllAfrica Global Media (allAfrica.com). To contact the copyright holder directly for corrections — or for permission to republish or make other authorized use of this material, click here.